When you were out enjoying the great weather we had last weekend, you might have noticed some strange looking white patches on your lawn and wondered 'What the heck is that?" 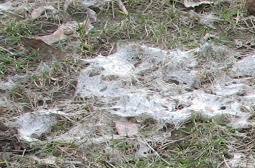 The answer is most likely Snow Mold, also known as Typhula blight. It's a fungus that often appears where there was heavy snow pack that hasn't melted as the temperatures warm up. When you get out to do your Spring Clean Up (or have Logic do it for you), just take the back of a rake and rake through the area allowing for new grass to emerge. You can also reseed the area if it is thin. In most cases there will be no damage to the crown of the turf and your lawn will bounce right back. A turf with high use of synthetic Nitrogen is more susceptible to snow mold and all other lawn fungus. Another great reason to chose an Organic approach to turf management.